Every successful business relies on efficient employees and managers. We are sure that all the entrepreneurs would, at least once, have aspired for an efficient, error-free and trustworthy manager to rely upon. Own Manager is the apt platform for you. It's sophisticated & advanced yet easy-to use applications will assist you the right way to enhance your business potentials. Own Manager helps you to automate many of your business functions in an error-free manner. Our applications will work 24/7 on your behalf and will maintain your business networks active consistently. We provide you progressive support with the modern technology and result assured apps. If you are looking for the ever best online business solutions for your business then we are here as your own manager to provide you with the required solutions. When you work with us, we become an extension of your business, values and practices. Whether on-site or online, we manage your business, meet you where you are at, accommodate you along with us and grow your business with us. Together, the team has over years of experience in business solutions, marketing, brand identity and full integration of all online and social media tools. Our team members are experts in their profession and have experience in working with most recognized companies in the world. Comprised of a best team a company can ever have, Own Manager is committed to provide its clients with finest custom designed online services to help the society to live better and achieve maximum. We do believe that our customers are our affluence; thus the company is pledged to serve them with best available service; always. We have a long list of absolutely free services for the users and these are in line with the companies’ philanthropic policies. Own Manager is an application designed to serve the clients form a-to z being your own manager. Starting from creating attractive profile, we have almost all the online business solutions to manage your business as your own manager. We have online business development solutions to forward your business profile to the clients in local market in India as well as all over the world. Our team will assist you in managing your sales and accounts as per your requirement. Even for managing your services, we have a professional team to manage the entire requirement. Also the business process outsourcing will be the right solution to reduce your cost of operations. Our packages are most cost effective depending upon the requirement. IOOM Global is an active training institute in the field of Personal and Professional Development Training. IOOM mainly focus on the areas like practical approach to office management and practical training based on your qualification. The programs are tailored to upgrade the skill-set so that the candidates are able to accelerate their career growth. OBM is a client driven business consultants committed to convey our customer’s strategic objectives and helping in improving, widening, and deepening the relationship to add esteem. We help our clients in reducing operational costs, record process upgrades and more significantly, concentrate on their core competence. ODS offers a wide range of Digital Services to businesses and organizations around the world with long-term support, experience & refined guidance. ODS ensures high -quality digital services and online marketing services through our experienced professionals. ODS team is skilled to provide necessary digital support to your business. 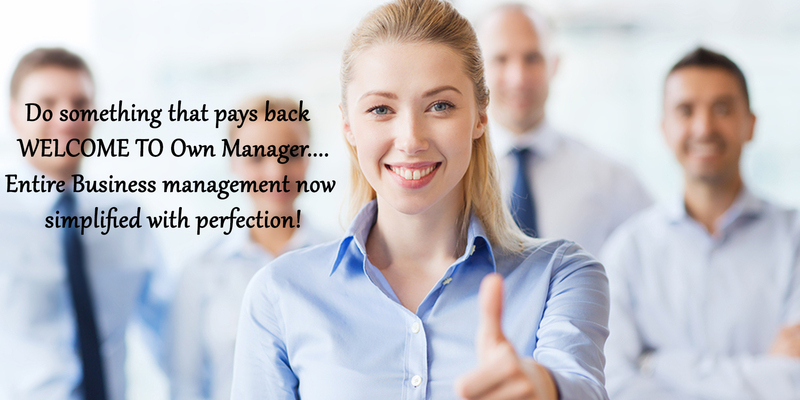 Your Own Manager works very Simply and easily ! Please drop your requirement in e-mail or with a call to us, our representatives will communicate with you and get your exact requirement. Once the requirement has been finalized, a deed of mutual understanding along with general terms and conditions and confidentiality agreement will be signed and that's all your own manager is ready to work for you! Our operations are managed from the Cultural Capital of Kerala, India and communicated through the business capital of Kerala, India and the international project development is being managed from the business capital of UAE.